These swirling glitter jars are super easy to make and are so beautiful to look at. They are perfect learning aids for toddlers and pre-schoolers because they can be filled with all sorts of additional and interesting objects like pom poms, sequins, buttons, plastic trinkets, EVA shapes, beads etc - which can be especially helpful while learning about colours and shapes. This is a quick and fun DIY craft to do with the kids, with real benefits as these jars help children (and adults) become more mindful. 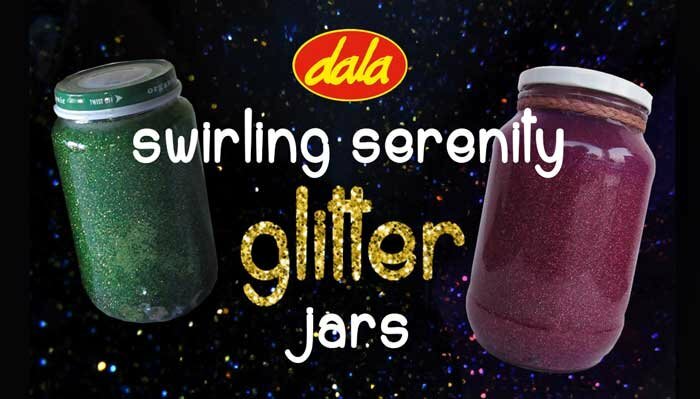 Just sitting and watching the superbly sparkly stuff, swirling around in the jar is said to have a calming effect. Remember - the more glitter, the better! 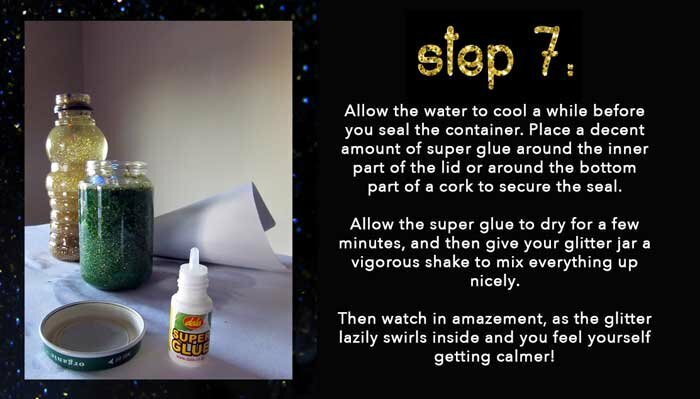 The more paper glue, the longer the glitter will stay suspended and swirl in the liquid. *Note: You basically want a ratio of 1 part glue to two / three parts water. For large (bigger than 750ml) containers more than one bottle of paper glue / Supersize Glitter Glue (125ml) may be needed. 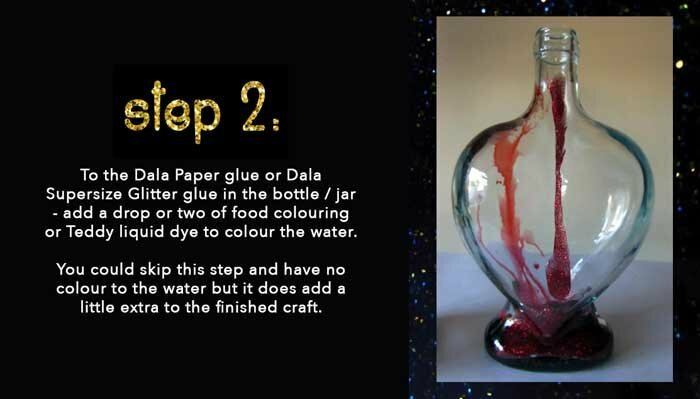 To the Dala Paper glue or Dala Supersize Glitter glue in the bottle / jar - add one or two drops of food colouring or Teddy liquid dye to give the water some colour. 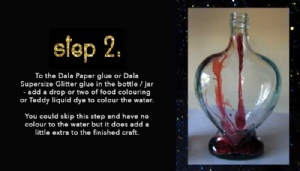 You could skip this step and have no colour to the water but it does add to the overall look of the serenity jar / bottle when complete. 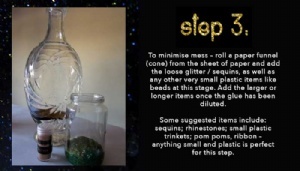 To minimise mess - roll a paper funnel (cone) from the sheet of paper and add the loose glitter / sequins, as well as any other very small plastic items like beads at this stage. Adding the larger or longer items once the glue has been diluted. 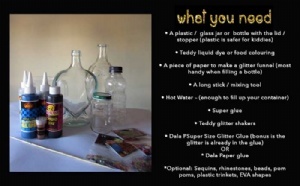 By now, your bottle should have a beautiful mess inside of it. Do not leave it to sit for too long or it will be difficult to mix. Boil some water, and slowly add the water into the bottle / jar, a little at a time, until it is at the halfway mark. 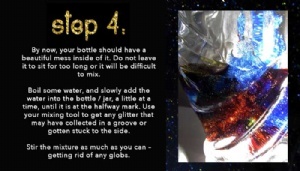 Use your mixing tool to get any glitter that may have collected in a groove or gotten stuck to the side. Stir the mixture as much as you can - getting rid of any globs. When your bottle/ jar is half full, add some other items at this stage if you choose. 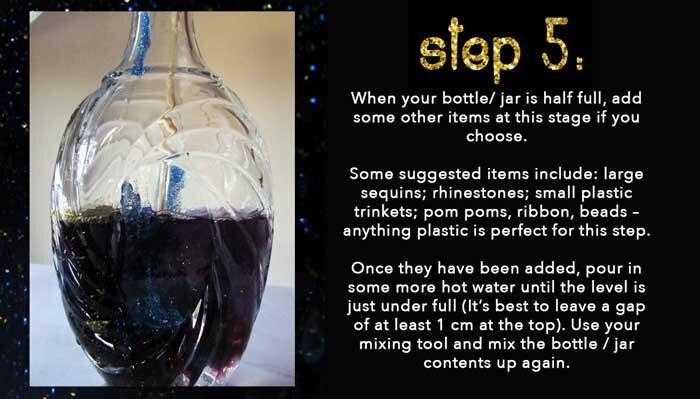 Some suggested items include: large sequins; rhinestones; small plastic trinkets; pom poms, ribbon, beads - anything plastic is perfect for this step. Once they have been added, pour in some more hot water until the level is just under full (It's best to leave a gap of at least 1 cm at the top). 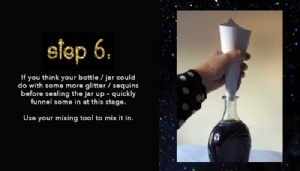 Use your mixing tool and mix the bottle / jar contents up again. 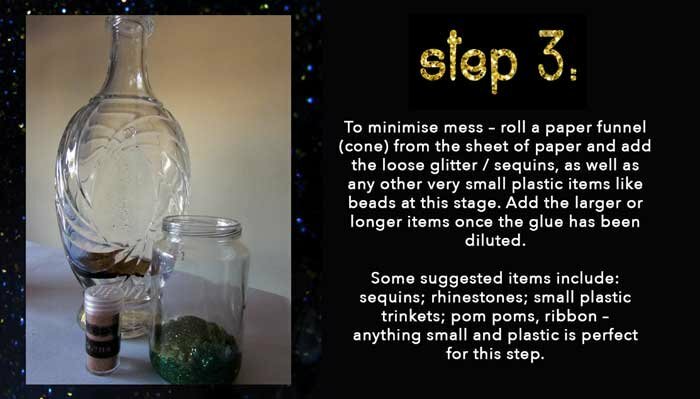 If you think your bottle / jar could do with some more glitter / sequins before sealing the jar up - quickly funnel some in at this stage. Use your mixing tool to mix it in. Allow the water to cool a while before you seal the container. Place a decent amount of super glue around the inner part of the lid or around the bottom part of a cork to secure the seal. 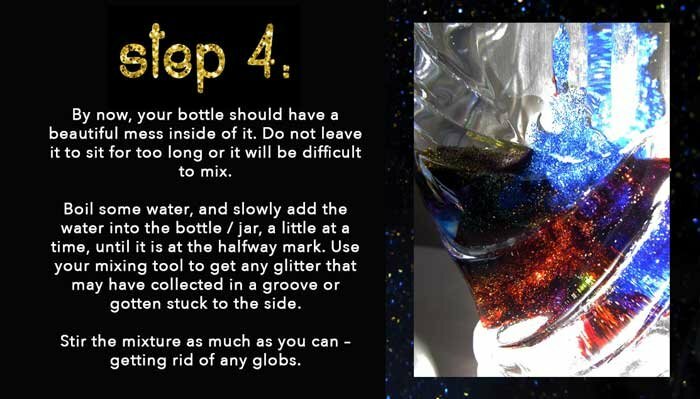 Allow the super glue to dry for a few minutes, and then give your glitter jar a vigorous shake to mix everything up nicely. Then watch in amazement, as the glitter lazily swirls inside and you feel yourself getting calmer! This item has 1607 views.